A promo for the game's port. 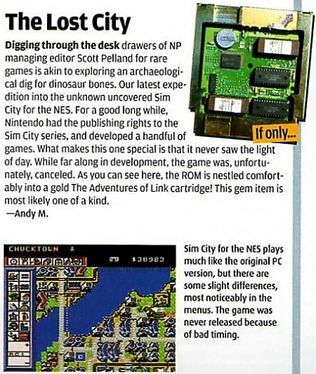 Originally announced in the September/October 1990 issue of Nintendo Power magazine were both NES and SNES ports of Will Wright's highly acclaimed SimCity, a city simulator and one of the first games of its kind. Both of the ports were slated for a Spring 1991 release and while the SNES game was released as planned (albeit being pushed back to an August 1991 release to coincide with the US release of the SNES), the NES port was cancelled shortly beforehand and never ended up seeing the light of day. In the November/December 1990 issue of Nintendo Power, two screenshots from the NES port of the game were released, along with a short rundown of the said port. It received a few additional mentions in the months to follow (including, notably, a couple of additional magazine write-ups and a short preview video). The game was eventually forgotten by most (assuming that the game had simply been cancelled), until 2005, when, in the "Collecting" section of an issue of Nintendo Power, it was revealed that a prototype cartridge of the NES port had recently been rediscovered in the desk of Nintendo Power editor Scott Pelland. The article revealed that the prototype cartridge was housed in a hollowed-out golden Zelda II: The Adventure of Link casing (including pictures of the actual cartridge) and revealed that the game was cancelled due to "bad timing" (unassumingly referring to the aforementioned 1991 US release of the graphically superior SNES and its corresponding SimCity port). Since the port's 2005 rediscovery, it has been kept tightly under wraps and a ROM has never been leaked online. It is currently unclear as to exactly who is now in possession of the prototype cartridge, though unless the said owner decides to share with the rest of the world, this rare and highly sought-after port will likely never be played by the general public. On August 29th, 2017, a NintendoAge user named BIGDADDYRAMIREZ uploaded 2 minutes of footage on YouTube of the prototype on the NES. The user is the owner of a chain of stores called "Back in Time" where some of the people who worked on Johnny's Arcade. Both of the prototypes will be displayed at PREGE (Portland Retro Gaming Expo) 2017 while one of the prototypes is available to play. 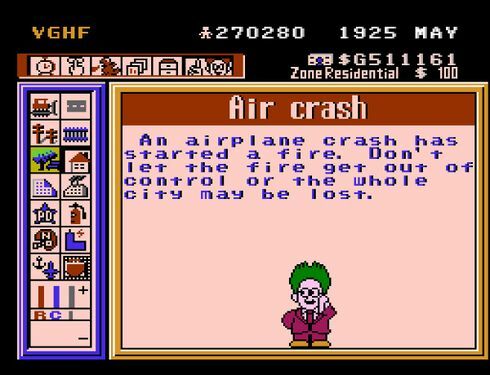 In October 2017, the Video Game History Foundation has claimed a copy of SimCity and has dumped it privately. 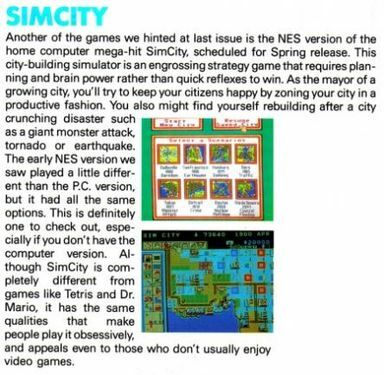 Frank Cifaldi, the organization's founder has stated that he will make SimCity for the NES publicly available soon. In the meantime, the prototype was displayed again at MAGFest 2017. Frank even shown off two never before seen screenshots of the title. On December 25, 2018, Archive.org user GameHistoryOrg dumped the ROM of the NES port to the internet. Video Power's Johnny Arcade at WCES '91, during which a playable prototype of the NES port of SimCity was showcased (0:48-1:29). 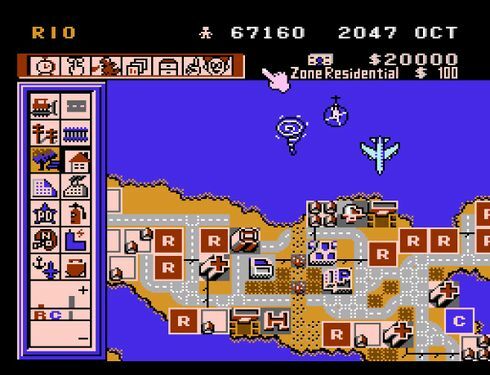 Footage of one of the SimCity prototypes on the NES. November/December 1990 Nintendo Power article in which two screenshots of the port were released. 2005 Nintendo Power article in which the rediscovered prototype cartridge was revealed. Screenshot of SimCity provided by Frank Cifaldi.